I’ve also been hoping they wouldn’t resort to a greater evil trope that they have to unite in order to take down. To me, Kylo Ren and his followers should be treated as the bad guys, but through the posutive actions of the good guys they are able to find a path to peace with their enemy rather than by just destroying them. But, there’s so little information that we are doomed to get false expectations or blow things out of proportion until we see the movie. I’m just gonna keep an open mind that they can make the Emperor’s return work and make sense within the story, and maybe it’ll provide some more context with how Snoke fit into this picture. I didn’t see anyone mention how the Emperor’s motif played in TLJ when Snoke threw Rey into the air. Initially I just thought it was a callback but maybe that will carry more importance in retrospect. At this point, the Emperor might be playing a bigger or smaller role than we are expecting right now. So the best thing is to keep an open mind and imagine how either option could work for you and the story. If we’re talking about holding out hope for a different title, I’m going to have to wait for the movie to prove to me that my suggested title “Legacy of the Skywalkers” isn’t better. Even then, the film features conscious evocation of the Death Star attack with the assault on the droid control ship. Ultimately, though I’m definitely more on the negative side, I am with you as usual. At the end of the day it will all depend on how it plays out. Phantom Menace also has the heavy visual Death Star parallels with the Trade Federation ships with the big sphere in the middle (which we also see blow up at the end of the film). When the Knights of Ren were mentioned the first time, I always expected them to be like mini-bosses in each film. Then have the classic final boss fight vs. Kylo in Episode IX. But that’s just too generic, I know. I’ve played too many video games, haha! I’m just amazed that they have had only one appearance so far (in a Force vision, of all things). Now that I know Palpy is back, I don’t know if I really care about the Knights anymore. I think I would’ve liked seeing Rey take on the Knights + Kylo in the final act rather than Darth Sidious playing mind tricks throughout. By the way, what are your guys’ thoughts on the theories of Palpatine just being a mere front for Plagueis all along? Or Palpatine being Plagueis himself / resurrected über vers. 2.0? D’oh! You got me; I hang my head in a moment of shame. So the fact that Palpy has been in nearly all the movies now in either person or referenced (& pending what IX reveals he may even get tied into 7 and 8 retrospectively), should we now call it “The Sith Lord Saga”? It’s probably more about it being recognizable than desirable to keep coming up. I don’t think the Emperor is back per say. I think it’s one of two things though. His Force essence is in someway hovering over or inside the submerged Death Star II and he will serve as a test for Rey and company to overcome as they seek a MacGuffin in the fight. Palpatine is back but it’s actually Snoke controlling the strings and puppeting something far more fearful. What if Snoke survived his perceived demise and is projecting a Force Illusion of himself as Palpatine in a game of riddles and clue to play with both sides? He’s actually the true mastermind. Maybe he’s actually Darth Plsgueis as mentioned in the opera scene during Revenge of the Sith? How could this work and be? A) In the comic re-telling for The Last Jedi he tells Kylo that he sees everything and saw the conflict in him as he tried to kill Han. B) in Aftermath a Dark presence tries to effect baby Ben in Leia’s womb. C) Snoke saw everything when he read Rey’s mind. This means he saw her conversation with Luke and the perception she now has that it was only Darth Sidious that was responsible for the rise and fall of the Jedi, etc… Except in the Tarkin novel we have Palpatine state he is grateful to the prophet and planner his Master had been. To me this implies he didn’t work alone in planning the subsequent events of the PT and OT. He could use this to toy with her. D) How could it be Plagueis and fit? 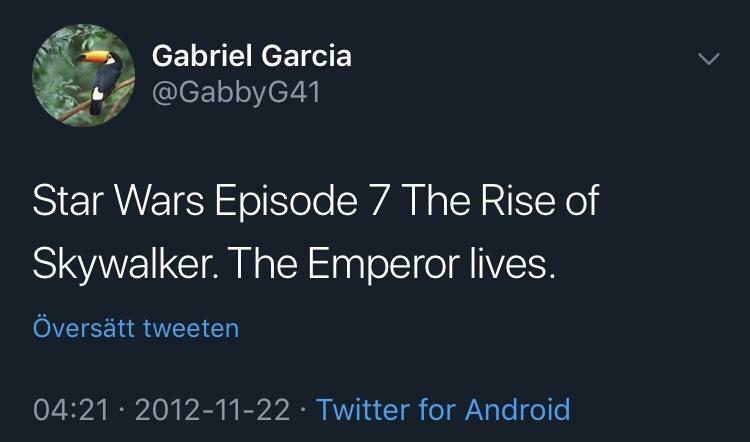 He could be the one who manipulated Jedi Master Sifo-Dyas to order the Clone Army and be responsible for the ‘Force striking back’ at him to create Anakin as was the case in Legends. The ‘Force striking back’ is stated in canon novel Tarkin, but has not clearly been defined to what it means. Yet. There’s also a canon comic that has a surving Jedi Padawan named Ferren Barr find a file about Darth Plagueis that he found for those he sees as involved in the ‘Clone crisis’ and why the Jedi fell so quickly. The events that saw the downfall of the Republic and birth of Anakin could be manipulated by Master and Apprentice in collaboration. This would ensure the legacy of Palpatine as a central main villain in the saga still stays in tack while also introducing us to the supreme intellect in the final act. E) What was he doing during the PT and OT? Training the Acolytes of the Beyond from Aftermath who later become the Knights of Ren, a new order of Dark Side users bidding their time and waiting to strike revenge on both sides. This leads to a team up of the Resistance and First Order. You know know like the Naboo and Gungans and Ewoks and Rebel Alliance. As well as he has been searching for the key to immorality. This is why he’s looking for the perfect embodiment of the Light and Dark and must have something pure and unbreakable of which to work as he states in The Force Awakens novel to Kylo. He feels this is where his apprentice comes from while reminiscing. F) Kylo says “Show me. Show me again, Grandfather…” Could Snoke have used Force Illusions before in the form of Vader and this planted the false seeds to young Ben of who he was meant to be? G) Snoke’s guards name comes from the Atrisian Emperor, in Legends they ruled Atrisia. The 54th Emperor was famous for this often referemced quote.
" There are three ways to defeat your enemy. The first, and most obvious, is to better him in a trial of force. The best way is to have him destroy himself…The middle way is to destroy your enemy from within. Judicious application of the middle way shall make your blows more effective if you later take the way of force. From the middle way it is also possible to push your enemy onto the path of self-destruction." What does Snoke say to Kylo about Hux?
" You wonder why I keep such a rabid cur in such a place of power. A curs weakness properly manipulated can be a sharp tool." He’s trying to divide the First Order from the middle way, while at the same time having them destroy the Resistance and New Republic. Remember, the Dark Side is the pathway to many abilities some consider to be unnatural and only one has discovered the secret to cheat death. And as Luke says to Palpatine “Your overconfidence is your weakness.” We see this twice. In the Throne Room on Death Star II and when he thinks he’s killed Yoda in the Senate Chamber. There’s even a Professor at University of Pittsburgh named David W. Snoke who wrote a paper on inteltcual design. Who does this sound like in Star Wars context? I don’t think these things are accidental. I think this really ties the whole saga together beautifully and shows each generation is just as important as the one that came before it. Much like the fandom. We all love Star Wars. Some of us love all of it, while some of us only love a fraction of it. This ensures that every generation’s story has meaning, a legend and an interconnecting story that brings the Skywalker story to a meaningful close. It goes with what J.J. said too. And why would J.J. ‘Mystery Box’ Abrams reveal now of all times that Palpatine is back? Wouldn’t he want to keep this a surprise and secret for as long as possible? Or could it all be a red herring to something greater? There is a lot to digest in this trailer. Palpatine is one of those. How will he come back. He seems to be of such big importance that his presence in the movie is not a secret. Ian is listed on IMDB as Palpatine. The question is if he is back in spirit, back in body, or back in hologram. The thing that is not a question to me is why he is back. There has been nothing about Snoke that has been a threat. He was the supreme leader of the First Order, but how he came to be that and all sorts of things about his past were left hidden. I would not be surprised if Palpatine is back in body and we find that he was controlling Snoke from behind the scenes. Palpatine’s contingency plan that has evidently cropped up in so many of the new books is a strong hint that Palpatine was coming back. While they aren’t part of the movies, they completely explain the rise of the First Order. It also fulfills Abrams promise to make this a proper close to the Saga. Palpatine was the bad guy of the previous two trilogies and the entire saga coming back to him only makes sense. I’m far more interested in the identity of the desert planet. I see 4 possiblities. It is Tatooine (too obvious, but possible). It is Jakku (appropriate for the trilogy as both other trilogies have revisited the first planet in a later movie). It is Jedha. This is my favorite - the one I’m hoping for as that world has ties to the Jedi and the Force and would tie in the importance of that film. It is my leading contender because of the natives and the vegetation (Tatooine had so little except at the Lars homestead and Jakku had nothing). But we fall into a trap that the environments we have seen on planets is the entire planet is the same. That may be true for Tatooine, Hoth, and Jakku, but there is no reason to believe that is true for any other planet as it isn’t the case for our own. The last possibility is that it is new planet. The mountainous terrain at night seems to be a new planet. Someone thought they saw Cloud City in one clip. The red forest is probably a new planet. The planet with the pieces of the Death Star would be Yavin IV or the moon of Endor. Either one has possibilities though from the shape of the weapon dish, I believe it is the first Death Star. And it would be like Abrams to take us back to the beginning for the ending. As for what the story is, there was no clue that I could detect. A few action scenes and a few scenes that show things happening, but nothing to string together. I am very interested. I think I sense a big saga level ending in the works. If he can pull this off, I will take back a lot of the negative comments I’ve made about Abrams. Part of me agrees with captainsolo; the sentiment he expressed undergirds my cautious hope. Every possible title for VII, VIII and IX had been thought up by someone at some point. Wasn’t there a no-budget fan film made prior to October of 2014 called Star Wars: The Force Awakens? 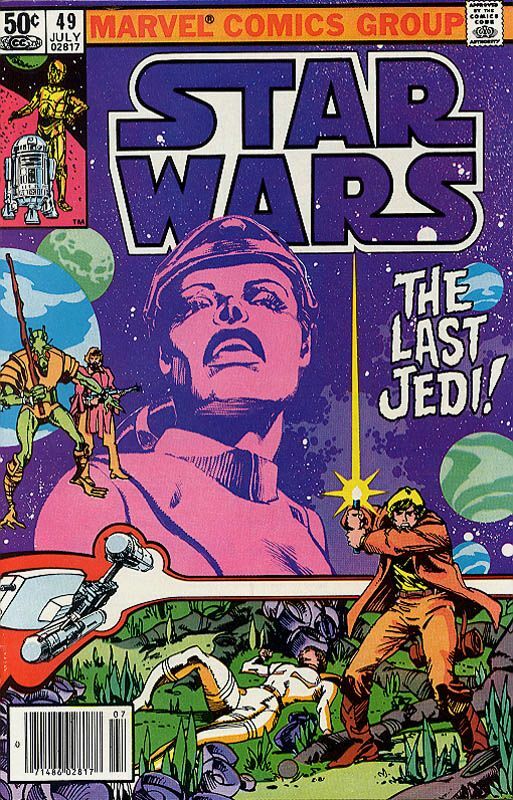 Wasn’t there an actual Star Wars novel (Legends now, I think) titled The Last Jedi?